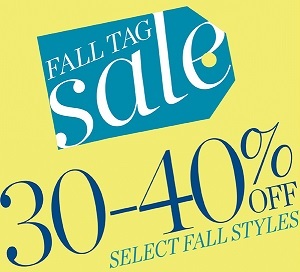 Enjoy Fall tag sale at Talbots retail stores in the United States. Smile all season. Selected fall styles available up to 50% off retail prices. Plus, take an additional 30% off markdowns. Source of the information is Talbots. Offer ends 10/25/2015. More details available at Talbots retail stores in the United States.